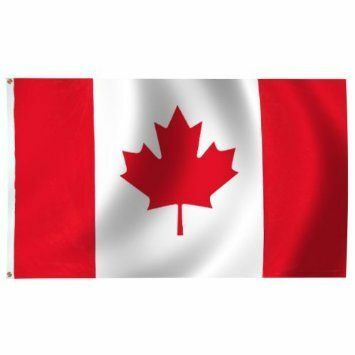 Our Canadian flags are on sale and come in a variety of popular sizes and materials. Our nylon Canada flags offer extraordinary beauty and durability, while our super-poly flags are a great economical choice! About the Canadian flag: The Canadian flag was born out of much debate. Despite the fact the Canada had been independent from Britain since 1867 the Canadians still used the royal Union flag. It was a red background with a Union Jack in the top left hand corner. In 1921 King George V1 of England proclaimed that the Canadian flag’s official colors would be red and white. From 1940-1965 competitions were held to try to establish a national flag. Prime Minister Lester Pearson held a 33-day debate about the flag in 1964. Finally the official Maple Leaf flag of Canada was adopted 1965. It has three vertical stripes of red and white, with a red maple leaf in the center.